Susan Andrews work explores the intersection between architectural design and contemporary art. Her recent practice involves developing two and three dimensional wall and floor works that evoke commonplace structures such as household furniture and architectural elements within the home. These objects are then painted to create spatial ambiguities in surface depth and shape, heightening our sense of awareness of the slippage between our visual perception of seeing and knowing and to bring into question our understanding of how we see, is something that continues to engage me. 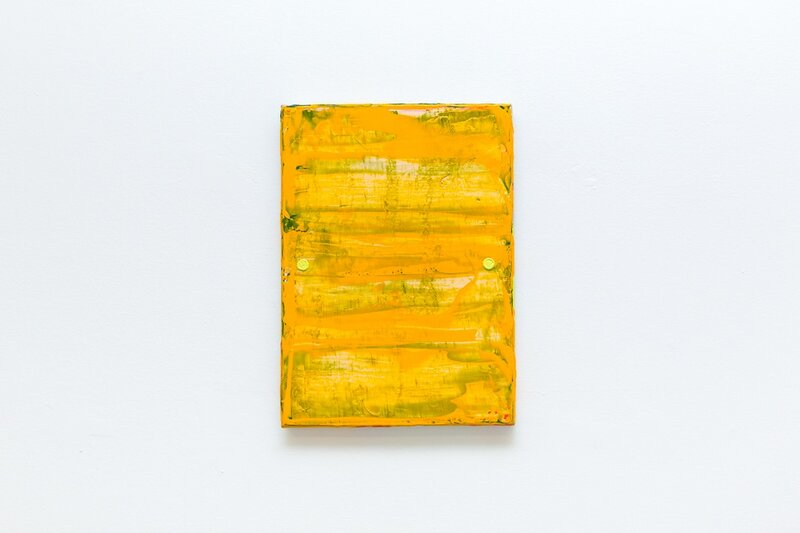 Zip, Running on empty and Untitled are painted constructions that explore notions of spatiality and displacement, through shape, space and brightly contrasting colour. The square and rectangle are important elements in geometry and useful in any form of design. These two geometric shapes are incorporated here as sequential units and form objects that refer back to the suburban house: to aspects of mass production and the homogenous IKEA units. These three works are constructed out of wood and hand painted so as to highlight the human aspect of production and to bring into our awareness the imposition of perfect uniformity. Susan Andrews has been exhibiting her work in commercial galleries, regional galleries and artist run spaces (ARIs) over 25 years. Her work has been exhibited in numerous art prizes including the Grace Cossington Smith Art Award, Jacaranda Drawing Prize, Dobell Prize for Drawing , Blake Prize, Adelaide Perry Drawing Prize and the Sulman Prize. Andrews has undertaken artist residencies in Beijing (2008), Paris (2006 & 2000), and Bundanon Trust (2005): she has been awarded the Onslow Storrier National Art School Paris Studio Residency at the Cité Internationale des Arts, Paris in 2016. Cooke explores his own personal mythologies and memories, and through geometric abstraction attempts to make these internal thoughts and experiences, external. He makes paintings as a form of self inflicted visual therapy, transforming his personal experiences into a physical object, each geometric form representing a different facet of memory. These facets of memory act as a departure point for the basis of his work. Each departure point differs radically, as he explores the detailed histories of art, music and modern design. Will Cooke’s practice is defined by the erratic study of self; the results are illusion based abstract paintings that deal with nostalgia, remembrance and intimacy. ​Will Cooke (b. 1989) is a Sydney based artist who uses abstraction to understand nostalgia and its relationship to sensory based experience. He finished a Bachelor of Visual Arts (Hons) at Sydney College of the Arts (SCA) in 2011 and is currently undertaking his Masters of Fine Art at SCA. Will Cooke has shown in numerous group exhibitions around Sydney and has had solo exhibitions at Chalk Horse, Sydney (2015), Gallery 9, Sydney (2014) and Alaska Projects, Sydney (2014). In addition to these exhibitions, Cooke has undertaken numerous private commissions, notably a multi-level foyer painting for residential apartment building ‘Stella’ designed by Tzannes Associates in Zetland. Currently, Cooke is preparing for a solo exhibition with The Arts Library Collective in New York City. My painting practice is inspired largely by the way pigment is transformed into form through movement, gesture and the physical encounter between materials. As an artist, painting provides a privileged site of visual and material exploration where the act of looking becomes an embodied, visual, tactile experience. The larger work Sanguine Earth, explores the way gestural marks create an image that is at once spatial and physical. Interested by the fundamental relationship between line and colour, I contrast the more linear, active field of the painting with a flat, horizontal band of pure colour bellow. This formal encounter is used to highlight the illusionistic, pictorial dimension of painting against a more concrete experience of colour as substance. The four smaller works are part of a larger series inspired by the techniques used in patisserie. The painter and patissier share a common pursuit – both are concerned in some way or another with the layering of stratums that combine to generate an experience for our senses. Using patisserie tools, I have developed successive layers of pigment and glazes to create a form that aims to solicit a visual, tactile and sensual response from the viewer. Unlike other forms of dominant media, I believe that painting confronts the spectator with an experience grounded in substance – a material encounter with the world that negates the omnipresent, disembodied, flat screen experience so prevalent to digital technologies. Miles Hall was born in Canberra, Australia in 1974. After studying at the Julian Ashton Art School, Sydney, he moved to Brisbane and graduated in 1997 with a degree in Fine Art from the Queensland College of Art. Miles was subsequently awarded a Diplome National Supérieure d’Expression Plastique DNSEP (Masters eqilvalent) from l’Ecole Supérieure des Beaux-Arts de Montpellier, France in 2005 and a PhD from Queensland College of Art, Griffith University in 2010. He has exhibited since the mid 1990s in Australia, France and other countries. His work is held in a number of public and private collections, in Australia, Europe, Israel, Asia and the USA. Miles currently lives in France where he teaches at l’Ecole Supérieure des Beaux Arts de Montpellier. Recent awards and prizes include the Jacaranda Annual Drawing Award (JADA) Grafton Regional Gallery, The Sunshine Coast Art Prize, the 6th International Drawing Biennale Melbourne and the Paris studio at la Cité des Arts, as the recipient of an Australia Council grant. Rachael experiments with the media of ceramic to produce painterly effects which border upon abstract expressionism and material sciences. The artfully haphazard installation of ceramic forms in wall spaces using industrial elements are a way to play with the interaction between trade, craft and art worlds, playing the value barriers between them. Often relying on chaos to produce “happy accidents”, each ceramic painting piece is a unique and risky venture due to the volatile process of the firing into installation and curation. "Large forms splurge from the walls to embody a dense and bulging entity which tracks a series of actions and reactions. Looking closely at the details of each piece reveals hidden stories of materials as they transformed, bubbled and shifted across the surface; each a motif prized in ceramic visual language"
I am interested interested in the simultaneous engagements of mind, body and senses and how they create an affect or "felt dimension": virtual space. I do this by making the engagement with painting a physical event where the experience of looking calls upon the viewer to be aware of themselves, and explore their own response to the work, be that expressive, intellectual or perceptual. Colour is an important element as it interconnects concepts around spatial cognition, cultural identity and the everyday. I find that colour functions as an opening between the exterior and the interior and provides as an access point to enter the realm of the virtual. 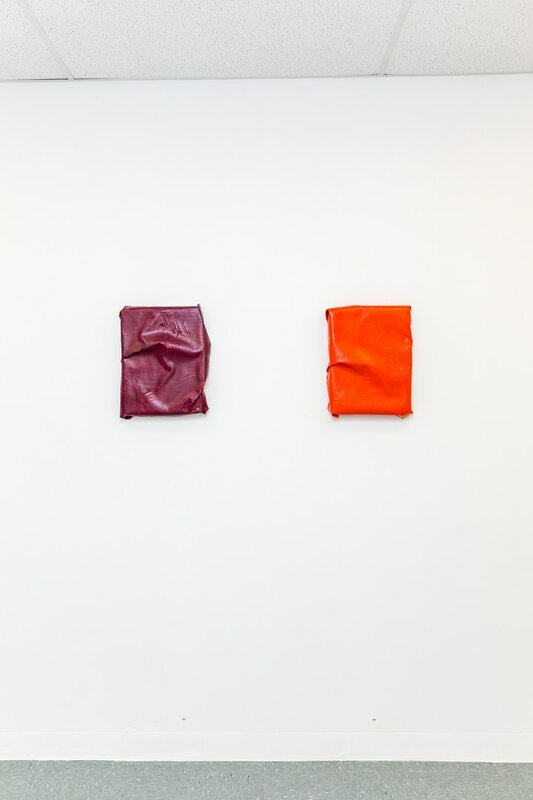 The “FOLD” paintings are part of an ongoing series that focuses on the physical qualities of paint in order to challenge the delineation between painting and sculpture and acknowledge the canvas as a subject in and of itself. This act of folding is adopted as a device to become aware of seeing and perceiving, so that painting is being experienced as opposed to being seen. 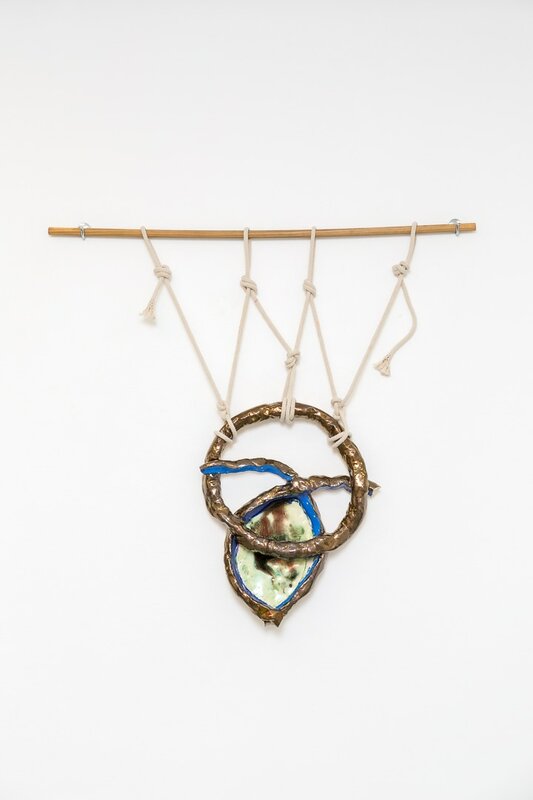 Joanne Makas has exhibited her work in several group shows and been a finalist in a number of art prize competitions. Joanne graduated with a Bachelor of Fine Art (Hons) Painting, from the National Art School in 2013 and is a founding Director of STACKS Projects.